One of the biggest challenges in most people’s lives is choosing a career path. In fact, there are a ton of different jobs out there that most people are unaware of. 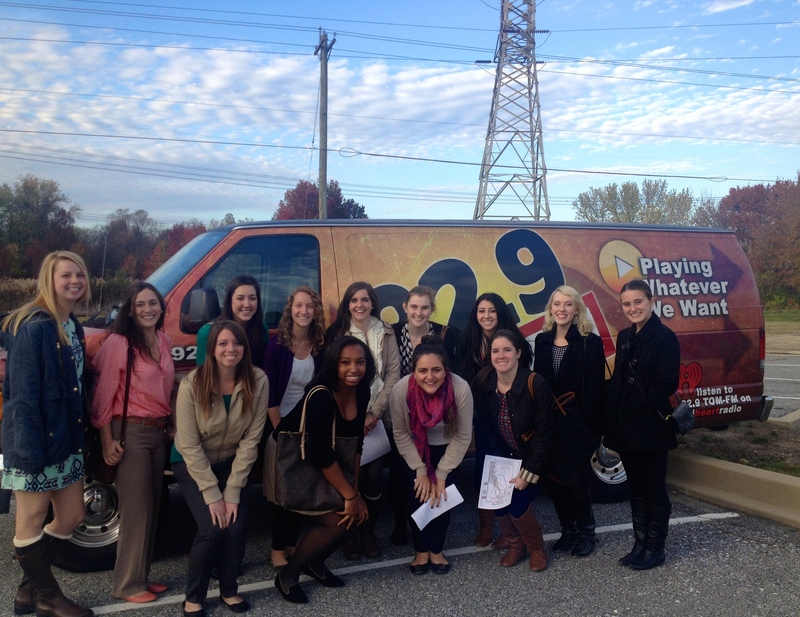 That’s why when a select few PRSSA members, myself included, had the chance to go behind the scenes on November 3 and visit iHeartMedia’s office in New Castle, Del., the opportunity to meet with a handful of individuals with unique and fulfilling careers was a true blessing. A personalized “welcome” sign greeted us in the waiting room where we were then whisked away and taken on a tour of the office. Starting the day off by viewing multiple recording studios, we were all pleasantly surprised when Sky Phillips, host of the Sky & Christa show from 94.7 WDSD (Delaware’s Country Radio Station), was in-between work and still had time to show what he does most days. Sky explained the technology behind radio stations and recording, answered all questions, and even allowed PRSSA-UD to pick a song he played live on the spot! Next, Anastasia Kincaid, the office’s Digital Content and Promotions Director, finished up our tour of the station and led PRSSA-UD into a boardroom. With printed out packets full of coverage maps and “At-A-Glance” notes detailing each main station’s information for everyone, members couldn’t help but feel professional. For a brief moment, it felt like we were a part of their team. Anastasia and the head of the iHeartRadio’s traffic analysis for the Delaware region graciously answered our questions for a half-hour. It was wonderful to hear about their job descriptions and what a typical day for them in or out of the office could be like. They informed us about the company’s events hosted year round for a variety of different charities, and how they went about keeping things interesting and new with each coming year. However, what was most inspiring of all was getting to hear about how both women loved their jobs. Both described a passion for what they do each day and how genuine joy results from helping people with their philanthropy events and daily work. It was also refreshing to hear that the radio station is actually women-dominated and you can really feel like you are making a difference. 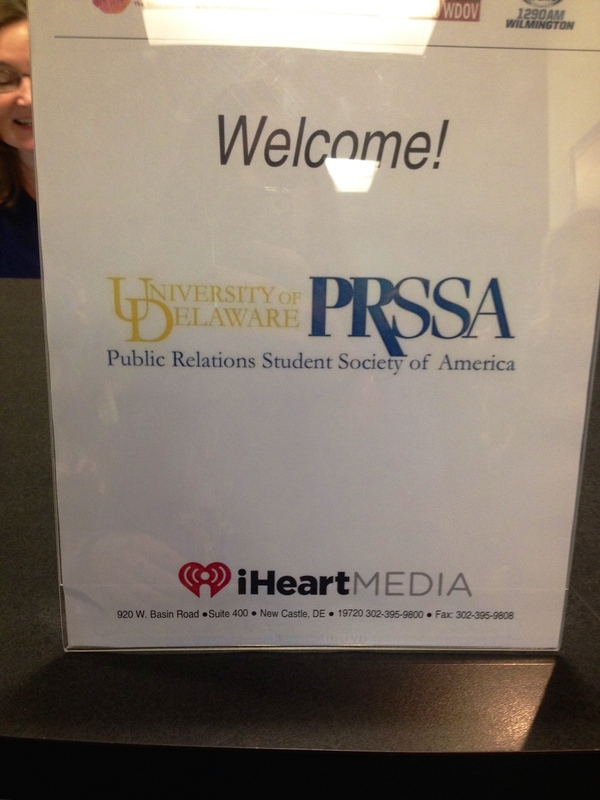 The day concluded with advice to PRSSA-UD members about how to get their “feet-in-the-door.” Most workers at the station started from just an internship! We were advised that any opportunity is a starting point. You can work your way up to anywhere you desire if you try hard enough, you just have to start somewhere and make as many networking connections as you can along the way! All in all the Fall Field Trip was a success and members couldn’t be more thankful for Katerina Vlitas, PRSSA-UD’s Assistant Program Director, for making the whole experience possible. iHeartMedia was full of kind and insightful workers, and each person we came in contact with taught us many lessons we will be sure to take with us as we go on looking and working for our dream careers. By: Brittany O’Connell, freshman communications interest with a hopeful minor in advertising. She is currently a new member of PRSSA and hopes to broaden her horizons, step out of her comfort zone, and help many throughout her first semester at UD.